Now that the holidays are over and the diet gurus have come out in full force to curb our appetite and check us back into reality, you might want to consider one pot main dishes for a change of pace. One of my favorites is stuffed cabbage. I like to think of them as the new "wrap." Inexpensive to make and satisfyingly good, cabbage is one of those workhorse vegetables that seems to be overlooked by many. Rich in vitamins A,B,C and E, cabbage is also high in fiber and research shows that it has a nitrogenous compound called indoles that can be helpful in lowering the risks of various forms of cancer. Cabbage is usually made into coleslaw or served as cabbage and corned beef but it is a perfect soup ingredient and great in stir-fry. 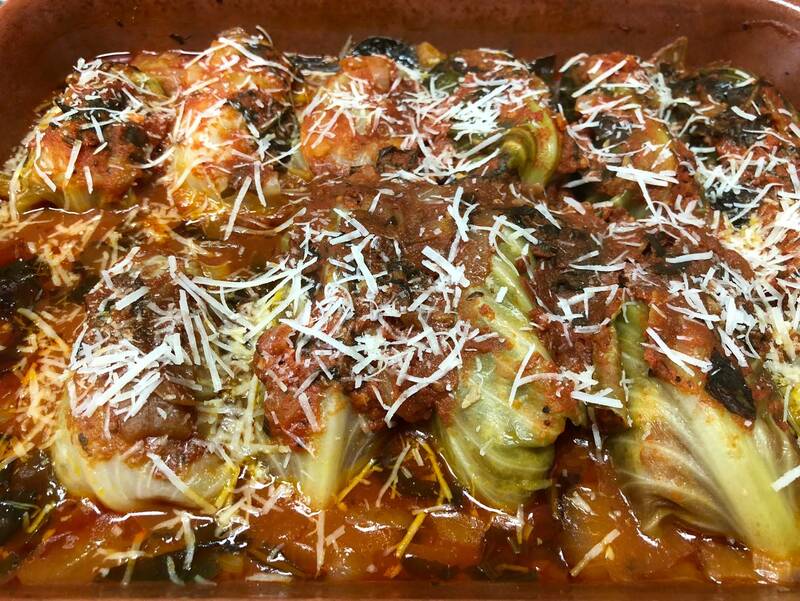 Northern Italians are known for their hearty cabbage dishes like cabbage and bread soup, braised cabbage and of course cabbage bundles or wraps. So meet winter head on in your kitchen and discover the versatility of cabbage. Instead of boiling the cabbage to wilt the leaves, just microwave them for 15 second; works like a charm and saves that boiling step! Wash the cabbage well and remove 10 whole leaves. Reserve the rest of the cabbage for another use such as soup or coleslaw. Place the 10 leaves on a microwave safe dish or casserole and microwave for 15 seconds until they are wilted. Set the leaves aside. In a bowl mix all the remaining ingredients except the tomato sauce. Spread a thin layer of tomato sauce in a 9x13 inch casserole dish. Spread each leave out on a cutting board. Place about 1/3 cup of the meat mixture in the center or each leave. Fold in the two side ends to encase the filling and then roll up the leave to make a small bundle. Place them in a single layer in the baking dish. Spread two cups of the tomato sauce over the top of the wraps. Cover and bake for 30 minutes. Uncover, sprinkle the tops of the wraps with additional cheese and bake 10 minutes longer. Serve hot and pass remaining sauce on the side. Thank you Deb for your comments; we have done shows from the Abruzzo area; spaghetti alla chitarra with lamb ragu was one of them; look for others on your PBS station and on our web site.